“From U p on Poppy Hill” opens Friday at Sundance Cinemas. PG, 1:31, 3.5 stars out of 4. There are no moving castles in “From Up on Poppy Hill.” No witches, no fishes who turn into children, no little people living under the floorboards.Madison movie fans who have been regulars at the Sunday afternoon “Cinematheque at the Chazen” Studio Ghibli retrospective series this year, they know that it’s not unheard of for the legendary Japanese animators to take a break from fantasy films. But for most Western audiences, who know Ghibli through “The Secret World of Arrietty,” “Spirited Away” and “Princess Mononoke,” the relatively ordinary plot of “Poppy Hill” might seem like a bit of a shock. But don’t worry, because “Poppy Hill” really takes place in two magical, powerful kingdoms that exist in the same place with each other. One is called the Past. The other is called the Future. And the wonderful “Poppy Hill” has, in its own gentle way, many wise and warm things to say about the difficulties of trying to live in both. Umi (voiced in the English-language version by Sarah Bolger) is a teenage girl living in Yokohama in 1963. Her father was lost at sea during the Korean War, and her mother is at school in the United States, but Umi is very capable, and can not only get her two younger siblings off to school, but can run a small boarding house out of their home as well. Yet, every morning, she goes out and raises the naval flags outside her house, in the faint hope that they will someday guide her father home. All around her, Japan is excited about the 1964 Olympics coming to Tokyo, and the country is in the midst of a cultural shift, trying to push away the painful past of World War II and look towards a bright future. At Umi’s school, that mindset comes to a head around the student clubhouse, a ramshackle old building nicknamed the Latin Quarter. The towering building houses all the clubs at school — the Archaeology Club, the Chemistry Club, even the one-man Philosophy Club — floor after floor of nerds stacked on top of each other. But the administrators see it as an eyesore and want it torn down before the world comes to Japan for the Olympics. Leading the student revolt is Shun (Anton Yelchin), who we first see leaping off the roof of the Latin Quarter and into a pond as a publicity stunt. Together, with Umi leading the girl students and Shun leading the boys, they try to whip the clubhouse into shape. Shun and Umi also fall in love — the most chaste, platonic love you’ll see on a movie screen in quite some time. But that love is threatened when the pair learn of a secret connection between their fathers, dating back years, that could scuttle their relationship. “It’s like a cheap melodrama,” grumbles Shun, which is a great joke, because of course in the hands of Studio Ghibli it’s anything but. The film was written (“planned”) by Ghibli’s master filmmaker Hayao Miyazaki and directed by his son, Goro Miyazaki. 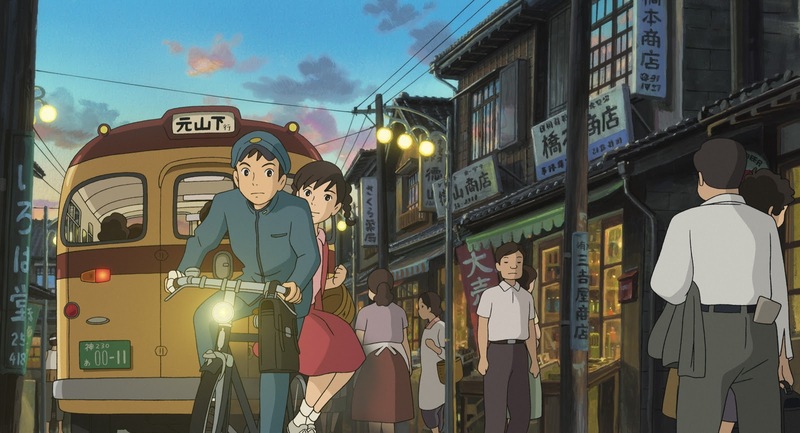 It almost goes without saying how beautiful the hand-painted animation of “Poppy Hill” is to look at, whether it’s the millions of tiny details in the labyrinthine Latin Quarter, or the evocation of a 1960s Japan street scene, with the peppy Japanese pop hit “Sukiyaki” playing on the soundtrack. But “Poppy Hill” proves to be more than just a visual feast. It’s seemingly slight storyline has a warm emotional resonance, tapping into both the uncertainty of a Japan caught between past and future, and adolescents Umi and Shun, caught between childhood and adulthood. Most movies posit the teenage years as someting to be endured, so it’s such a treat to see Umi and Shun taking charge of their lives, at home and at school, learning how to master their regrets and uncertainties. It’s easy to build up a lot of empathy for these characters, and the hope they carry forward with them. In my household, the film was perhaps a bit too slow and fairy-free for a 5-year-old who loved “Arrietty,” but the 9-year-old was captivated. As was the 44-year-old. One further note: like many recent Studio Ghibli imports, the film is dubbed into English rather than subtitled, and in the past the English versions have been rather poor, with colorless dialogue and flat vocal performances. The translation in “Poppy Hill” feels a cut above those recent efforts, though, with Yelchin and Bolger turning in appealing performances ahead of a large supporting cast that includes Aubrey Plaza, Bruce Dern, Jamie Lee Curtis and Gillian Anderson, as well as a very funny surprise cameo by Ron Howard.